Two equestrian riders, girls on horseback, in low tide reflections on serene Morro Strand State Beach, Morro Bay, CA October 29, 2008. This is, as of 8/9/2011, my "most interestingness" photo on Flickr. RE: "Be sure to add a sentence in your description field as to why you think this photo became so interesting/popular to the Flickr community." A: "This photo got traction because it is simple - there are no distracting background elements. It looks pretty good in its thumbnail form. Rule of thirds applied gives negative space for the subjects, here on horseback, to ride forward. It tells a little story of people riding horses on a deserted beach at low tide on a foggy day." Lesson: Simplicity is best. Don't ruin an image by including irrelevant elements. Point-and-shoots may yield a winning photo. This was taken with a Canon PowerShot SD950 IS, and is one of my most popular images at Flickr with 67,000 views and 950 favs, despite being intentionally over-processed. Please add comments/notes/tags to add to or correct information, identification, etc. Please, no comments or invites with images, multiple invites, award levels, flashing icons, or award/post rules. Surprisingly, this snapshot taken with a just a pocket Canon PowerShot SD950 IS is amongst my most-viewed photos on Flickr (11/09 ~30K views) and has been over-processed with artificial gradients and tone - Thanks to all for the kind comments. 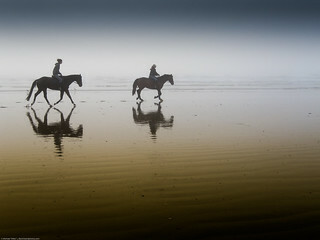 Two equestrian riders, girls on horseback, in quite a foggy day, with low tide reflections at sunset on Morro Strand State Beach 29 Oct. 2008. Michael "Mike" L. Baird Canon SD950 point-and-shoot snapshot. This photo has some "way overdone" Lightroom 2 gradient treatments applied: gold bottom-to -center; blue top-to-center toning. Serene mood. Also characteristic of Montana de Oro area to the south. Digital 100 Examples lesson: "More can be less." Sometimes the better photo is the one with fewer elements and/or a simple background or context into which a focus of interest can be composed. Notice the rule-of-thirds at play here as well, and use of the leading space to the right to lessen tension for the riders moving in that direction. 19 April 2009 Awarded #2 in Share Your Best with the World "reflections" contest. Actually, see a dozen derivatives at a contest here. Jan 2009: Creative Commons use note - see this discussion at www.flickr.com/groups/textures_only/discuss/7215760992353... where my horses on beach image is the starter image in a mod competition. 18 March 2009 Creative Commons use note at Women's Nook. piece I'm writing about Creative Commons for the next issue of Photo Pro magazine: could you let me know if you have any objections? We'll credit you and link to your Flickr account accordingly, of course... Charlotte Griffiths, Photo Pro Magazine, charlottegriffiths [at} bright-publishing d o t com." I said: "That's fine - thanks for asking!" 25 June 2009 Creative Commons use note: Used in the Digital Photography School, 20 Effective Reflection Photos lesson. 18 Sept 2009 This is one of my most viewed and "most interesting" photos. It is now the seed for a theme challenge "After Dark Reflections." 29 Sept. 2009 Used as the first example of cool reflection images at Lightstalking. 05 Jan 2010 Creative Commoms use note: :: silecroft beach - Hello! A: Thanks! Sounds great! Best success on this project. www.flickr.com/people/mikebaird/#credit says preferred attribution process. 04 Feb 2010 Creative Commons use request, approved. hello. Thanks for using my equestrians here www.flickr.com/photos/mikebaird/2985066755/page6/ under Creative Commons, and giving attribution. If you could link to the subject photo page and not just the parent property, people could find the images' source more easily. Many thanks. 25 March Creative Commons use. I consider the above attribution to be a bit insufficient. I'm fine with use, but the source and author have to be clearly indicated, so that further re-use makes reference not to pixdaus pixdaus.com/?sort=tag&tag=girls horseback riding_low tide_reflections_by mike baird but to www.flickr.com/photos/mikebaird/2985066755/ "
* Copyright violation notice to copyright@yahoo-inc.com. * "I have a good faith belief that the disputed use is not authorized by the copyright or intellectual property owner (me), its agent, or the law." * "under penalty of perjury, I state that the above information in my Notice is accurate and that I am the copyright or intellectual property owner and thus authorized to act on the copyright or intellectual property owner's behalf."